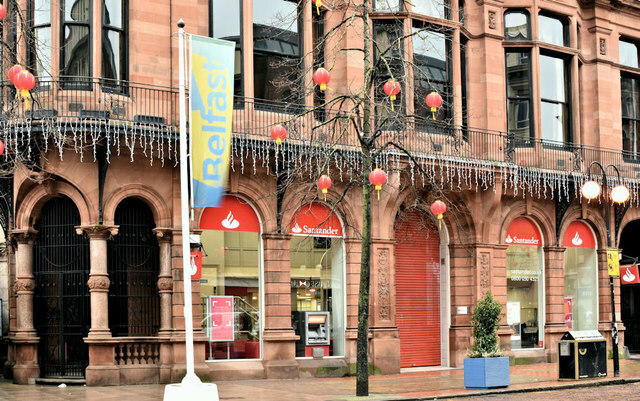 The Santander branch, at 6 Royal Avenue (ground floor of the Ulster Reform Club), is not included in the current round of branch closures. One of the buildings erected as part of the redevelopment of Hercules Place and Hercules Street as Royal Avenue and one of two landmark buildings at the southern end (the other was the Provincial Bank (now a Tesco). It was built, of red sandstone, in 1883-85. The architects were Maxwell and Tuke of Manchester. The material has survived well. This plain but distinguished building includes some interesting features and detail.